We are fully experienced in the use of lime mortars (especially Hydraulic) and understand the importance of using these mortars in older and more traditionally styled buildings. We have carried out a great deal of sensitive restoration and repointing work over the years and are used to working on occupied properties, where high levels of regard to protection and cleanliness are required in order to minimise disruption. 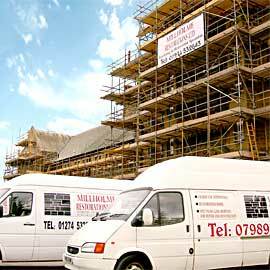 Commercial & domestic repointing, restoration and renovation specialists in Yorkshire. Based now in Baildon, just outside Shipley, and still essentially a family business, Millholme Restorations was formed just over 25 years ago by John Bruce – who still carries out all initial site visits personally. Initially we worked exclusively on residential restoration projects but since 2001, we are now taking on more and more commercial restoration projects too. We carry out work mainly in and around Yorkshire, though are happy to (and often do) travel further afield. All our staff are fully trained and experienced in all the different aspects of repointing, restoration work and we also work closely with reputable cleaning (sand blasting) companies who we are happy to recommend. As members of The Guild of Master Craftsmen you can be assured of the quality of our work; additionally we have all achieved CITB Site Health & Safety Accreditation. As you would expect we hold all the necessary insurances to act as bona fide contractors and always implement a full, written, health and safety policy. For a free consultation and quotation feel welcome to get in touch and we’ll arrange for John to call out and see you and your building. From this we can let you know about the most suitable solution (and mortar type) to ensure your building is in the best condition possible, and stays that way too. We would also point out that having been in the restoration business for many years we have contacts with other specialist building contractors who we will happily put you in touch with, such as roofing, guttering or decorating – should you require any of these additional services. Equally we are happy to work with, and around, other contractors who may also be engaged on a project.